The history of aviation in Azerbaijan goes back to 1910 when the Oil Boom was in full swing in Baku and there was considerable business and cultural interchange with Europe. Photo: Students of Baku Technical College (now the Oil Academy) alongside the airplane they constructed in 1910. Aviation was a technical innovation at the time. 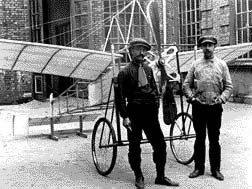 The Wright Brothers had just tested their first powered plane in 1903 and signed contracts with Europe for the production of their planes in 1908. Everyone was eager to see these new flying machines and so an International Aviation Week was organized which took place in October 1910. At that time the population of Baku barely exceeded 200,000 inhabitants. However, the role of Baku as a rapidly growing industrial center and the most advanced city of the entire region was indisputable. Therefore, it was selected to host the first aviation show in the Caucasus. Flights were scheduled to take place in a field near Balakhany Highway (now the main road to the airport). Two famous pilots, Sergey Utochkin and Gaver Vlynsky, were invited to participate. Utochkin's flights were scheduled for October 20-23, 1910. Bakuites took an overwhelming interest in the show. So much so that the price of tickets could demand an exorbitant 30 rubles 60 kopecks for an improvised box, seating six persons at the edge of the airfield. Such a price was equivalent to an entire month's salary for an oil worker. The flights were supposed to begin at 1:00 pm that afternoon but the crowd had been gathering since early morning. By 3:00 pm the field was totally overcrowded but more people just kept coming. Mounted police and soldiers were required to control such a large crowd. Around 3:30 pm, the plane was rolled out of the hangar. 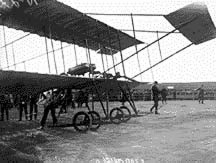 It was a "Farman" type biplane, the most up-to-date model. Then Utochkin started the engine. At first, it produced a rather wheezing sound but soon afterwards, it caught and the gigantic propeller started to turn. The plane stood motionless for a few moments while soldiers held on to its tail. Then the command was given. The tail was released and the plane began to move. It wasn't long before it shot up like a bird. However, a strong gust of wind carried it off course far to the left. Nevertheless, Utochkin managed to maintain control and after circling the airfield, he brought it down successfully. The crowd went wild and kept applauding until the demonstration was repeated four more times! In the remaining days that followed, Baku experienced strong winds, which were typical of the season. However, Utochkin refused to cancel the flights, though it was too dangerous to circle overhead. In several instances, he took off and flew only a few meters landing on the other side of the field. Left: Practical Classes at the Naval Aviation Officer's School in Baku, 1916. On the very last day after managing to climb quite high and gain sufficient altitude, all of a sudden there was a loud clunking sound and the engine backfired, putting the plane into a tailspin. The audience was horror-struck as it witnessed the plane falling headlong above them. Just in the niche of time, Utochkin managed to pull the plane out of the spin just before it would have crashed. The crowd heaved a sigh of relief as the plane landed safely near the hangar and Utochkin jumped out. Bakuites greeted him as a hero and began chanting his name and extending bouquets of flowers. The International Aviation Week continued with Gaber Vlynsky, another famous pilot of that time. Vlynsky was known as a fearless aviator and had been awarded Aviation Club diplomas in Paris (France), Odessa (Ukraine) and Rostov (Russia). He arrived in Baku on October 28, 1910. Vlynsky's beplane was equipped with the most advanced engine-the "Gnom" model which had a capacity of 50-horse power. Three days of Gaber Vlynsky's flights (October 28, 29 and 30) turned into another memorable event for Baku. In the middle of World War I, the Russian Government decided to set up a special Naval Aviation Officers' School. They wanted a port for their seaplanes and chose Baku as it would be least affected by the cruel winter weather. The School was organized jointly by the General Naval Headquarters and the Aircraft Department of Russia. Three hangars and a short launching pier were constructed on the largest wharf of the city, "Stony Wharf," in front of Mir Babayev's Residence (nowadays the SOCAR Office Building). Photo: Seaplane type FBA, #67 at the wharf of the Naval Aviation Officers' School, in front of the present-day SOCAR Building (State Oil Company of Azerbaijan) in Baku 1916. The opening ceremonies for the Naval School took place on November 1915 with more than 500 outstanding Bakuites present, including city administrators, prominent Oil Barons, public figures, religious clergy, scientists and the mass media. "Kaspiy", the largest Russian language pre-Revolutionary newspaper in Baku, published a description of the first seaplane flight which reads, "Sailing over the waves, the seaplane took off smoothly like a magic flying fish, feeling itself both King of the Sea and the Air. It was a magnificent sight." The Administrative Board and Training Personnel of the Naval Aviation School in Baku originally consisted of 30 officers. The students were all volunteers. Within two years (1915-1917), they managed to train a number of excellent pilots and specialists in the field of naval aviation. Unfortunately, the disturbances and disorder brought on by the Russia Revolution in 1917, tragically interrupted the traditions established of this first Naval Aviation Officer's School. The institution was short-lived (1915-1917) and its history consigned to oblivion during the Soviet Period. Fuad Akhundov is a regular contributor about Baku's early history. Nina Fischeva has worked with at Azerbaijan State Archives for more than 35 years. She is Director of its Photo and Cinema Materials.